4.1 out of 5 based on 260 bloggers and 65 commenters. 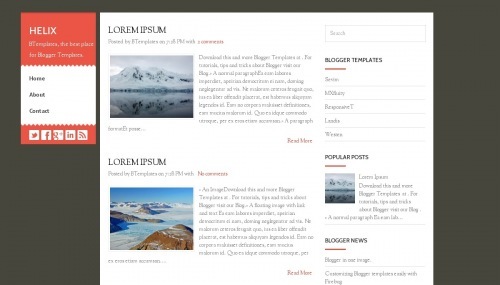 Helix is a free blogger template adapted from WordPress with 3 columns, left and right sidebars and social bookmarking icons. Excellent template for blogs about any general topic or crafts. Thank you for this great post, highly useful. Terima kasih :). Saya menggunakan tema ini pada blog saya. THis template looking very beautiful.thank you share this template. Just desire to say your article is as amazing. The clearness in your put up is just spectacular and i could think you are an expert on this subject. I’m amazed, I have to admit. Seldom do I come across a blog that’s both equally educative and engaging, and let me tell you, you’ve hit the nail on the head. I’m very happy I found this during my search for something concerning this. A great post again this is my first time on your Theme but i am just stuck here.